Members of Kevin Carey’s family who traveled from all over the U.S. for his homegoing ceremony: (l t r) cousin Torence Carey, sister Malanna Carey, sister Dr. Latanya Carey-Ledford, Bryant Carey, niece Danielle Ledford. 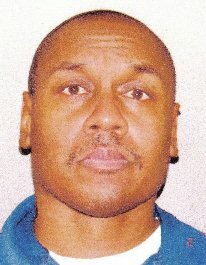 Kevin’s friend Michael Harris, incarcerated for life. Harris was a co-founder of the People’s Task Force. DETROIT — Members of Detroit Kevin Carey’s family traveled from all over the U.S. to join with dozens of Detroiters who fought in the trenches with Kevin for his people and all the oppressed for decades. 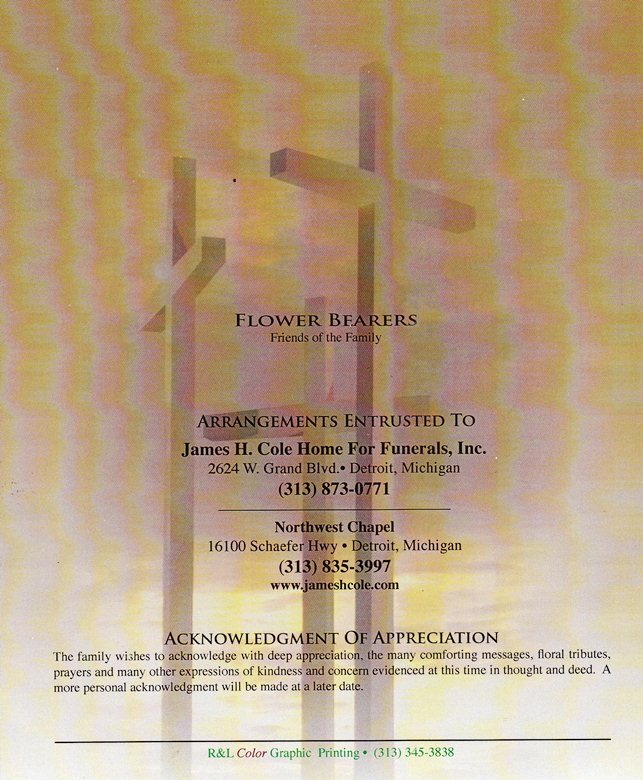 During the memorial ceremony held at the James H. Cole Northwest Chapel, many took the mike to pay emotional, heartfelt and militant tributes to their friend. Kevin passed away June 11, after a long battle with various illnesses. His friends and family said despite those illnesses, he kept on in the struggle. One friend said he told Kevin, who corresponded with and advocated for prisoners throughout Michigan, that there were 48,000 incarcerated in the state. He said he asked him whether he was going to fight for every one of them. Kevin responded with a firm “YES,” he said. Kimberly Green protests Detroit EM Kevyn Orr’s meeting with creditors at Wayne Metro airport June 14, 2013. 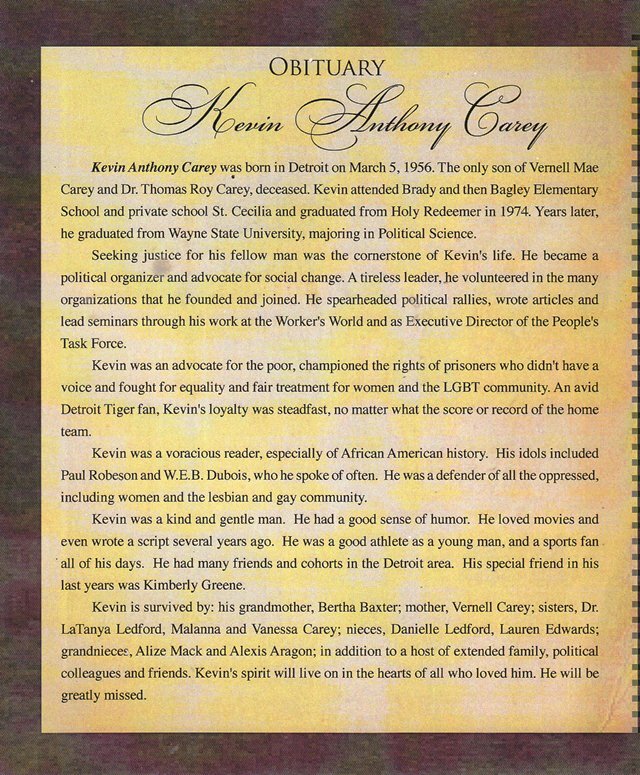 Kevin’s obituary was read by his friend Kimberly Green. Green worked with Kevin on the Detroit People’s Task Force, set up several years ago by prisoners and their families to free those wrongfully incarcerated due to hundreds of errors made by Detroit’s crime lab. The crime lab scandal was broadly publicized in the daily media, as were protests led by the People’s Task Force. Eventually, the Task Force took on the cases of other prisoners as well, with the assistance of its legal staff Cornell Squires and Leonard Eston. 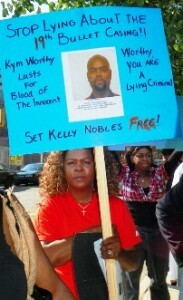 Marilyn Jordan demands freedom for her son Kelly Nobles during Task Force rally June 17, 2011. Along with Squires, Task Force President Marilyn Jordan was moved to tears when recounting the dedicated work Kevin did on behalf of prisoners. They included Jordan’s son Kelly Nobles, incarcerated in 2002 on crime lab evidence Jordan says was falsified. Nobles just missed the deadline Worthy set for going back to review evidence in questioned cases. Many spoke personally of Kevin’s warmth and caring for people, his sense of humor, his love for movies and the Detroit Tigers. Kevin’s father was a medical doctor in Detroit at a time when there was severe discrimination against Black doctors. 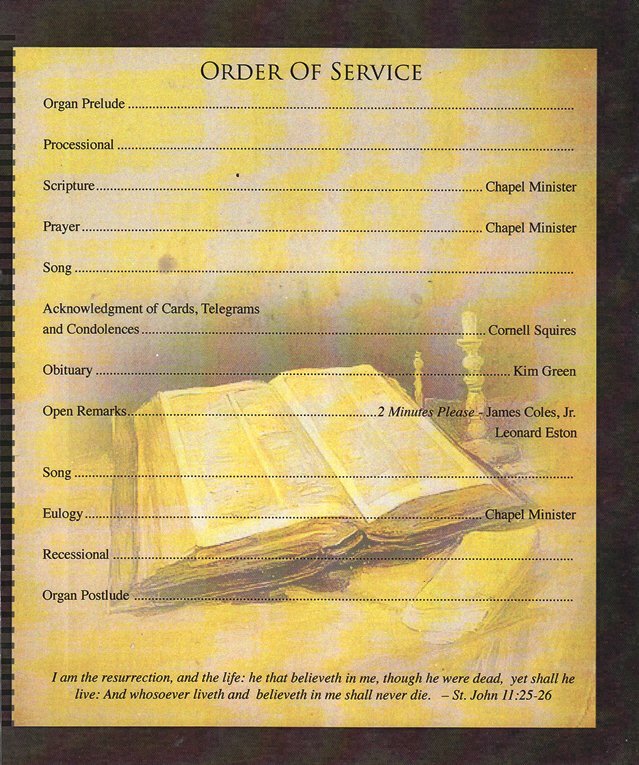 His sister Dr. LaTanya Carey-Ledford, who coordinated the funeral ceremonies, carried on the family tradition. She said she graduated from Wayne State University’s Medical School and later practiced for many years at Detroit Receiving Hospital, then known as Detroit General before it was privatized in 1980. Nelson Mandela, leader of South Africa and the ANC. Jerry Goldberg of Workers World Party recalled that Kevin worked on the campaign to free Nelson Mandela decades ago, before Mandela’s name was widely known. 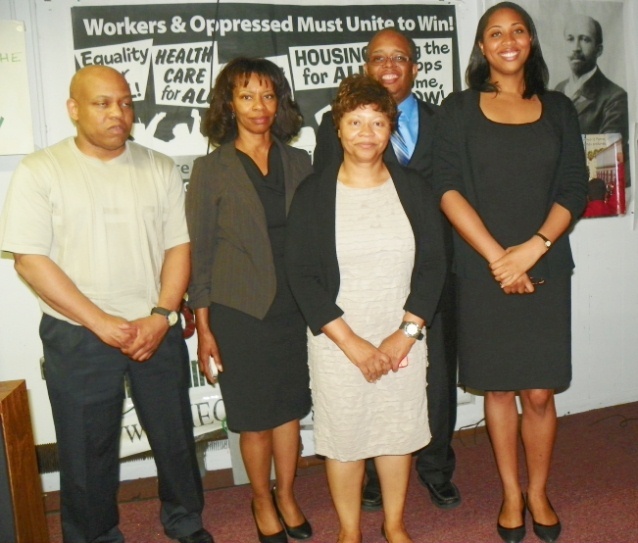 Members of the African National Congress came to Detroit for events Kevin and others planned, Goldberg said. 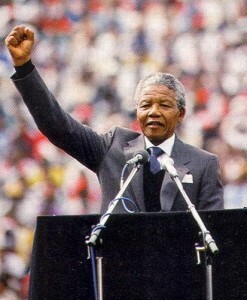 Mandela is close to death himself now, after 28 years of incarceration by the apartheid South African regime, his victorious release, and his tenure as president of South Africa afterwards. The chapel minister was visibly moved by the stirring tributes paid to Kevin, many of which exceeded the two-minute limit listed on the program. He concluded the ceremony with a comforting statement that even though warriors like Kevin may not live to see victory from their battles, they will live on when victories are achieved. 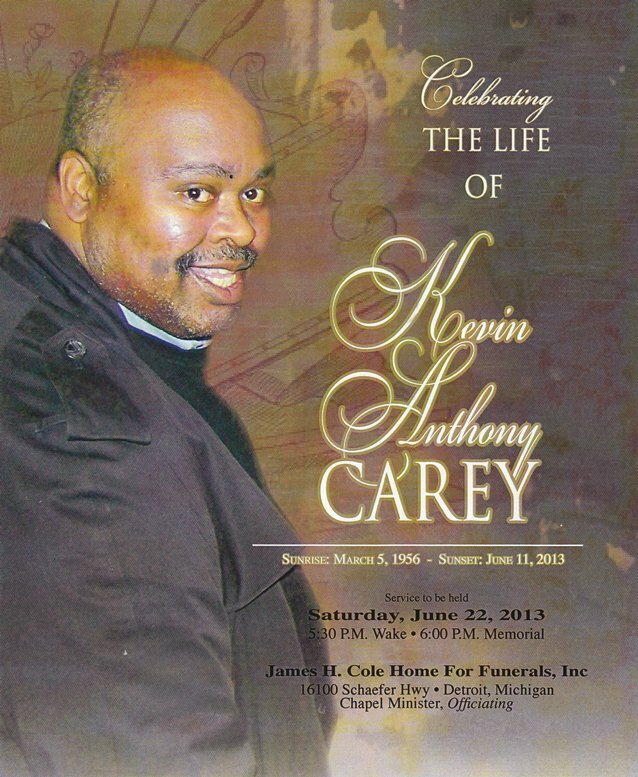 After the ceremony at James H. Cole Chapel, Kevin’s family and friends joined to celebrate his life at the Detroit headquarters of Workers World Party at 5920 Second. It was several hours before they finished getting to know each other, and reminiscing about Kevin’s life and love for the people.